GULF SHORES, AL- The 46th Annual National Shrimp Festival has selected a design by artist Robert Towson as its Official Poster Design for this year's event. Mr. Towson's design was selected from over thirty entries. This is the second time one of his designs has been selected for the official poster following his first winning design in 2014. 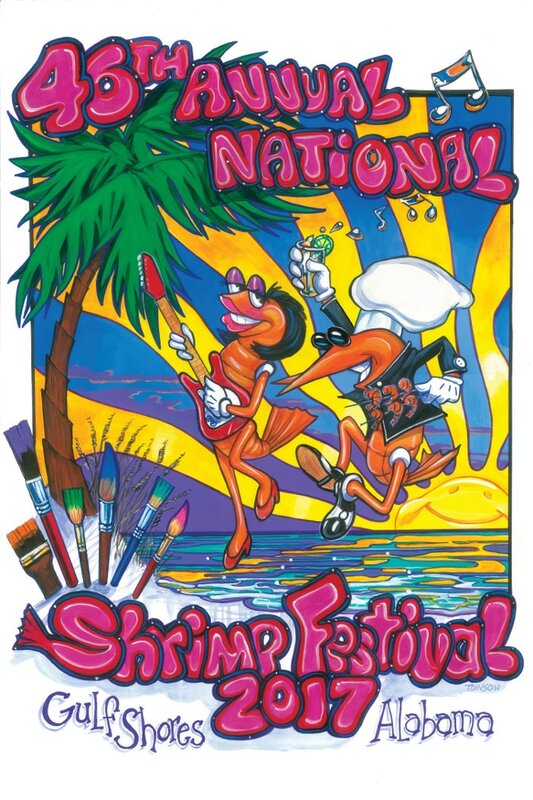 The poster competition is an annual tradition of the Annual National Shrimp Festival and the winning poster is selected each year by the Shrimp Festival Committee Members. "The vibrant colors and animated shrimp featured in the design really evoke the fun and excitement of our festival," said Vicki Stillings, VP of Special Events for the Chamber. "The winning design does a great job of encompassing the three primary elements of the festival: food, music, and art." Mr. Towson's successful entries in the Annual National Shrimp Festival competitions are not his only successes. His work won the Great Gulf Coast Arts Festival competition in 2000 and the Pensacola Jazz Fest in both 2001 and 2004. "It feels great to win this prestigious award for a second time," said Mr. Towson, who has been an artist since he was four years old. "I started airbrushing in 1987 in Gulf Shores, so I feel like I've come full-circle in some respect." You can purchase the winning poster online and in the Chamber's office in Gulf Shores beginning in August. Mr. Towson will be on hand during the festival to sign and number a limited supply of prints. This year's Annual National Shrimp Festival will take place in Gulf Shores from October 12-15. For more information, please visit the festival website at www.myshrimpfest.com.